Fresh strawberries are a healthy addition to any diet. 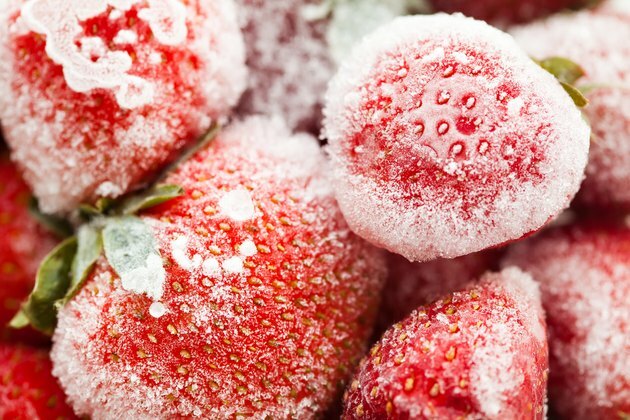 The health value of frozen strawberries depends on the type you choose. Unsweetened frozen strawberries provide many of the same nutrients as fresh and their benefits are available year-round; however, sweetened versions can add too much sugar to your diet. One cup of thawed, unsweetened strawberries, provides 77 calories and no fat. This serving contains more than 150 percent of the recommended dietary allowance for vitamin C, based on a 2,000-calorie diet. Strawberries are also a source of vitamin K, folate and manganese. Eating unsweetened, frozen strawberries in place of higher calorie snacks, such as chips or candy, can help you manage your weight. However, if you choose sweetened strawberries, the calorie count per cup increases to 199 calories. Both sweetened and unsweetened strawberries provide 5 grams of fiber per thawed cup. Fiber can help prevent constipation, promote colon health and lower cholesterol. The Institute of Medicine recommends women consume at least 25 grams of fiber daily and men eat 38 grams. One cup of unsweetened strawberries contains 10 g of naturally occurring sugars. The same size serving of sweetened strawberries contains 47 grams of sugar -- amounting to more than 9 teaspoons of added sugar per cup. The American Heart Association recommends limiting added sugar to 6 teaspoons per day for women and 9 teaspoons per day for men. The natural sugar in unsweetened strawberries does not count toward this limit, but a serving of sweetened, frozen strawberries quickly puts you at, or over, your daily added sugar allotment. Frozen fruits are packaged at the peak of ripeness. Fresh strawberries that come distant areas may be picked before they are fully ripe, which may prevent them from reaching their nutritional potential. During transport, these fruits may also experience nutrient degradation because of exposure to heat and light. Frozen strawberries also offer a preferable texture and more intense flavor for smoothies or purees. When thawed, however, frozen strawberries are flaccid and do not make good additions to fruit salads and tarts. How Do I Defrost Whole Frozen Strawberries?